To be able to attend the market fair, a lot of people have to leave home very early, some have to spend the whole day travelling to the market and some have to depart two or three days prior to the market day. On the market day, people coming from all directions pour into the fair-ground, making it more and more crowded. All types of home-made products, including farming equipment, embroidered costumes, foodstuff and animals, are brought to the market, on horseback and in baskets carried on the backs of local people. There is no doubt that the year-end fair is the most crowded one of the year. 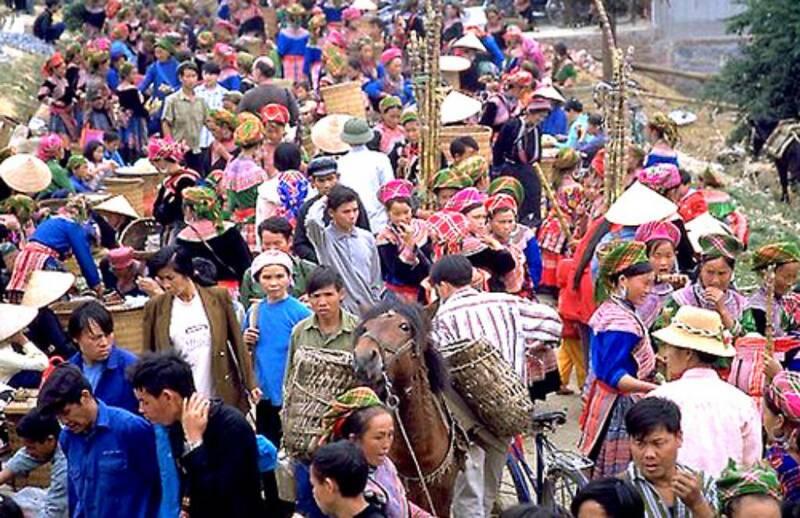 Coming to year-end fairs gives observers a better insight of unique features of local ethnic people. There is a corner of the market filled with the scent of sticky-rice wine and hot pans of Thang Co (a specialty cooked from horse’s meat, bowels, hearts, livers and lungs and vegetables, bones and some special spices), the place for people to gather and drink, wishing each other a prosperous new year, and also the place to get acquainted with new friends. The year-end fair is the place where the largest quantity of local commodities are sold to cater for New Year festival’s demand. It is also here that the prosperity and achievements after a year of hard work are reflected. The mountain people go to the market not only for buying and selling. They come here for social gatherings as well. As such, in addition to the exciting trading atmosphere, year-end fairs are characterized by the special cuisine and accompanying social gatherings. The corner of the fair is vibrant with the sound of music exchanged among young males and females in their most beautiful costumes. It is here that a lot of couples have met and later become husband and wife when spring comes. Although the life of local people nowadays is different, having their cultural features mingled with those of other ethnic groups, year-end fairs are still strongly characterised by typical cultural traits of mountain people. If you have a chance to attend such markets in the Northwest, it will surely be an unforgettable experience.